, a very eminent Portuguese mathematician and physician, was born in 1497, at Alcazar in Portugal, anciently a remarkable city, known by the name of Salacia, from whence he was surnamed Salaciensis. He was professor of mathematics in the university of Cojmbra, where he published some pieces which procured him great reputation. He was mathematical | preceptor to Don Henry, son to king Emanuel of Portugal, and principal cosmographer to the king. Nonius was very serviceable to the designs which this court entertained of carrying on their maritime expeditions into the East, by the publication of his book “Of the Art of Navigation,” and various other works. He died in 1577, at eighty years of age. 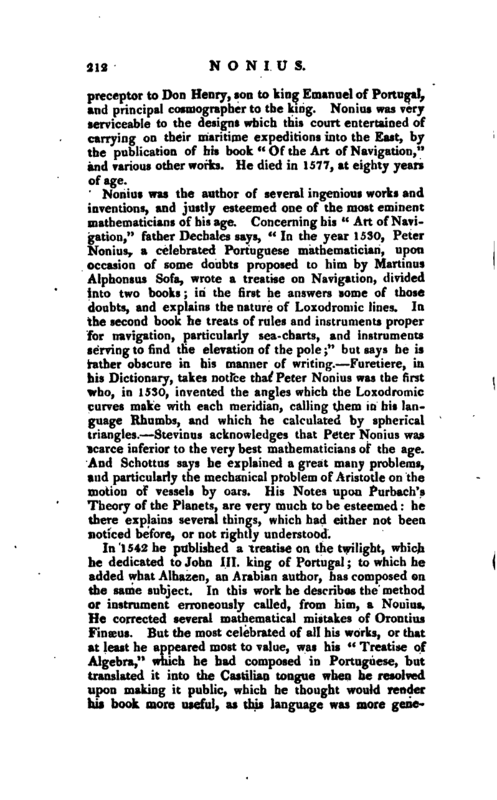 Nonius was the author of several ingenious works and inventions, and justly esteemed one of the most eminent mathematicians of his age. Concerning his “Art of Navigation,” father Dechaies says, “In the year 1530, Peter Nonius, a celebrated Portuguese mathematician, upon occasion of some doubts proposed to him by Martinus Alphonsus Sofa, wrote a treatise on Navigation, divided into two books; in the first he answers some of those doubts, and explains the nature of Loxodromic lines. In the second book he treats of rules and instruments proper for navigation, particularly sea- charts, and instruments serving to find the elevation of the pole” but says he is rather obscure in his manner of writing. 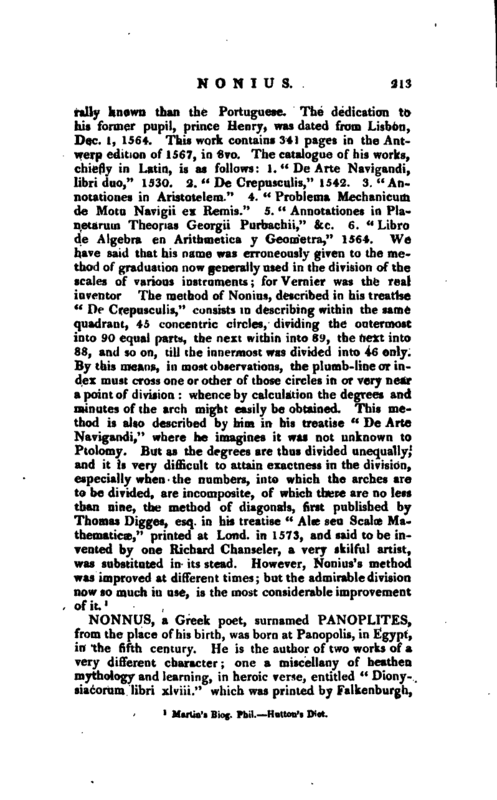 Furetiere, in his Dictionary, takes notice that Peter Nonius was the first who, in 1530, invented the angles which the Loxodromic curves make with each meridian, calling them in his language Rhumbs, and which he calculated by spherical triangles. 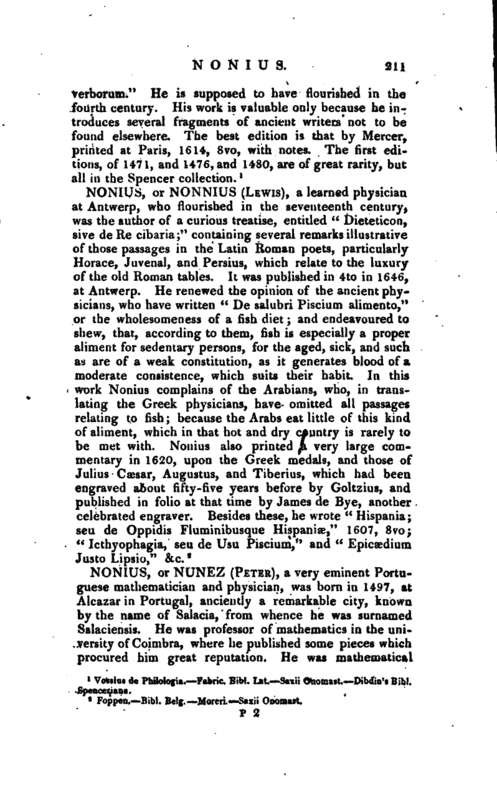 Stevinus acknowledges that Peter Nonius was scarce inferior to the very best mathematicians of the age. And Schottus says he explained a great many problems, and particularly the mechanical problem of Aristotle on the motion of vessels by oars. His Notes upon Purbach’s Theory of the Planets, are very much to be esteemed: he there explains several things, which had either not been noticed before, or not rightly understood. Martin’s Bieg. Phil. —Hutton’s Dict.